Building a Successful Group Run…. As I was driving to the group run for our running club today, I must say the thunder and lightning were scary I didn’t want to go. However, there wasn’t really an option for not going because most of the club was racing, we had a few newbies who said they were coming out for the first time, and I was the self-designated group leader. I always say, you build it and they will come but the bottom line is that somebody has to show up to get everyone started. I know this, I believe in it and I certainly do not want to see one person get dissuaded by showing up for a group run and being the only one. It’s just not cool in my opinion. So even though I knew we would be light on numbers today due to area races, the weather and the number of people who had texted me to bail, I was going to show up, just in case. As a result, I met a new friend, Heather. Brian was also there and snapped a quick photo of us between rain showers! Have two group leaders, who are reliable and will show up regardless of weather. Group leaders should communicate with one another so if one can’t go for whatever reason, they know for sure the other will cover the run. Schedule the group run for the same time & day each week. Don’t change your time/day because “Suzie” can’t come at that time. If you are a leader and decide to run mid-day and are scheduled to lead the 5pm run, better plan for the 2nd run or show up with your bike to get everyone started. Unless you are a specialty group or a competitive team, encourage all paces and levels of ability. Post group runs thru the Park District, local running store, and/or local health clubs to let area runners know when and where to show up. 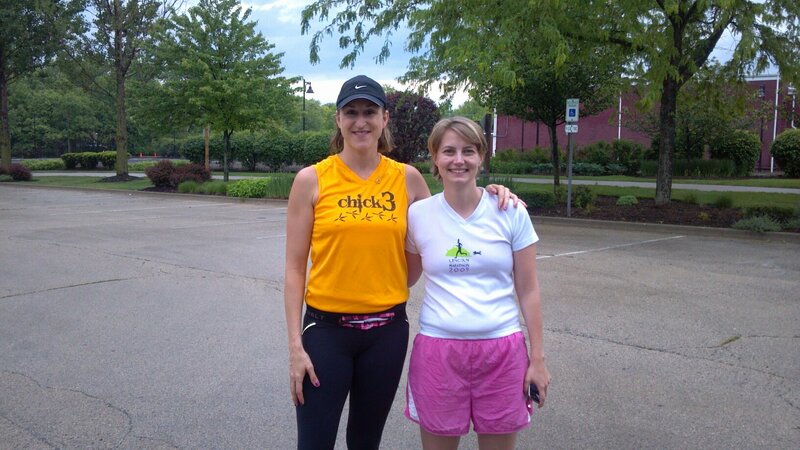 Encourage runners to bring a friend, or their kids, or whatever will help them get out the door to show up. Know that everyone is busy and their time is valuable so pay attention and get everyone started pretty much on schedule unless you know for sure that somebody is running late. Being a group leader doesn’t mean being a coach, just that you get everyone moving toward the trail at the appropriate time. Know that most people show up for a group run for FUN, stress relief and exercise so keep things upbeat and light if possible. Make sure you get to know the new people so they show up next time. You get to talk to “Suzie” every week, take the opportunity to meet somebody new! 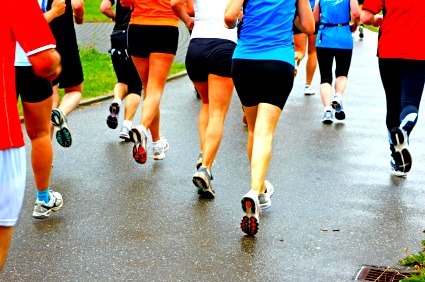 Do you run with a group or are you a solo runner? Any tips on successful group runs? This entry was posted in Running and tagged being a group leader, Building a Successful Group Run, F'N Running Club, FNRC, Frankfort New Lenox Running Club, Group leader, Group Runs, organizing group runs, Running by tootallfritz. Bookmark the permalink. Great tips! Thanks:) I have thought about starting a running club so I will definitely take your advice! I run solo on the weekdays. Wish I could get someone to run on the track beside me. :) On the weekend runs, I’ve met several people who run, so we always text each other the night before the run. It would be nice to have an organized system! I’m a solo runner, but want to find a group to run with with! I just have to look into local running clubs for my area! I have a group of women I run with every Sunday and I wouldn’t say that anyone is really a leader. I suppose if the group gets too large – we may need to have two people take the lead or something. We do keep to our Sunday 7am schedule. Right now we mostly communicate about running through email . I tend to be a solo runner, but I like mixing it up and running with others for some of my runs.